A precious metal is a rare, naturally occurring metallic chemical element of high economic value. Chemically, the precious metals are less reactive than most elements. They are usually ductile and have a high lustre. Historically, precious metals were important ascurrency but are now regarded mainly as investment and industrial commodities. Gold, silver, platinum, and palladium each have an ISO 4217 currency code. The best-known precious metals are the coinage metals gold and silver. While both have industrial uses, they are better known for their uses in art, jewellery and coinage. 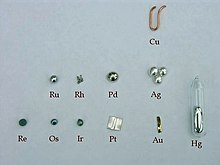 Other precious metals include the platinum group metals: ruthenium, rhodium, palladium, osmium,iridium, and platinum, of which platinum is the most widely traded.